Use this procedure to fix problems using the AISBackup integrated disc writer. 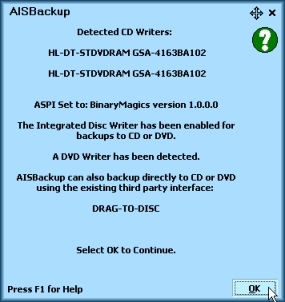 AISBackup reports that the CD or DVD cannot is not recognised or failed to create the disc properly. The CD cannot be read using Windows Explorer. When AISBackup is closed down the disc can be read using AISBackup and can be read using Windows Explorer. This problem may be cured by changing the ASPI drivers, see Procedure, below. From version 2.1 of AISBackup (including the beta versions) the validate (Test) phase may be skipped until AISBackup is restarted, however, it is recommended to try and fix the problem by switching the ASPI drivers. 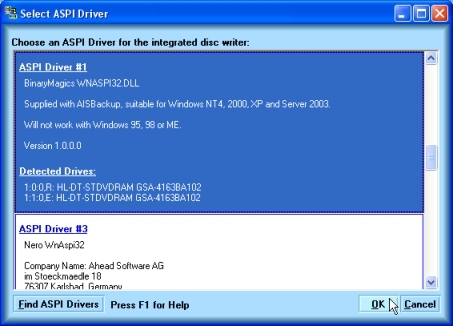 Windows XP Service Pack 2: When using the integrated ASPI drivers AISBackup cannot test a newly created CD or DVD until AISBackup is restarted. Changing the ASPI driver to the Binary Magic's ASPI driver (supplied with AISBackup) usually fixes this problem. 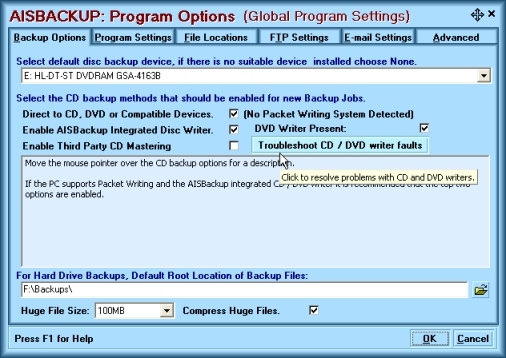 AISBackup may not be able to test a newly created CD or DVD when running Windows 95, 98 or ME. It is possible that a third party ASPI driver is not compatible with AISBackup, use the following procedure to find and use an alternative ASPI driver. Start the CD trouble shooting procedure by using the menu option Tools / Program Settings and Options. Then click the button Troubleshoot CD / DVD Writer Faults. AISBackup tests the current interface and then displays a summary, click OK to continue. For Windows NT4, 2000 and XP users it is recommended to select the BinaryMagics ASPI driver, click OK, see below. 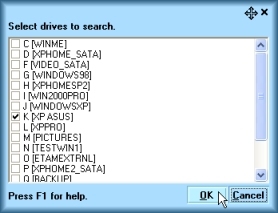 For users of Windows 95 98 and ME it is recommended to click the Find ASPI Drivers button to search the PC for alternative ASPI drivers. From the found list select an ASPI driver, generally ASPI divers from companies like Adaptec, Roxio and Nero tend to work quite well. The above form shows that AISBackup is about to search the K: drive for suitable ASPI drivers.